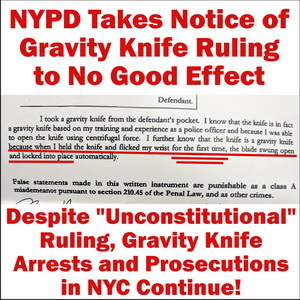 UPDATE: NYPD Takes Notice of Gravity Knife Ruling to No Good Effect! As we previously reported, New York City’s abuse of the state gravity knife ban to unconstitutionally arrest tens of thousands of innocent knife owners took a hit in a Federal District Court ruling last week when Judge Paul A. Crotty issued a narrow ruling finding the state’s gravity knife law to be unconstitutionally void for vagueness as applied to the plaintiff’s circumstances. At the time we posted this WARNING which we reiterate here: At this time, nobody should take this decision as changing anything of substance in New York City with regards to their persecution of knife owners carrying common folding knives. The judge agreed with the plaintiff in that regard and ruled that the statute is unconstitutional as applied to a knife that cannot be flicked opened on the first or second attempt. The case and the judge’s decision relied heavily on elements developed in our own long-running Federal civil rights case against the City and DA.As expected, the NYPD have adjusted to the ruling, as shown in the Complaint above, in order to continue their arrests and the DA will be quite willing to prosecute the knife owner. WARNING: At this time, nobody should take this decision as changing anything of substance in New York City with regards to their persecution of knife owners carrying common folding knives. We caution knife owners in New York City to be wary. Moreover, we’d like to remind New Yorkers and those traveling to and through the City, that besides this whole Gravity Knife issue, the city has its own ordinances regarding knives, including that you must carry 100% concealed. Clipping a knife to your pocket is asking for trouble in New York City. Click for full details. Meanwhile, Knife Rights’ federal civil rights case that is attempting to rid the city entirely of its infamous “wrist flick test” is on petition to the U.S. Supreme Court Three strong amicus briefs have been filed and the Court has directed the City and DA Vance to respond to plaintiff’s petition for Writ of Certiorari. In addition, our friends in the New York legislature have bills in motion to again attempt to put an end to this abuse in New York City. New York City’s abuse of the state gravity knife ban to unconstitutionally arrest tens of thousands of innocent knife owners took a hit in a Federal District Court ruling on Wednesday, but the actual impact on the City and DA’s arrests and prosecutions is expected to be small, depending in part on how the City and DA react. In a narrow ruling, Federal District Court Judge Paul A. Crotty found the state’s gravity knife law to be unconstitutionally void for vagueness as applied to the plaintiff’s circumstances. This decision is subject to appeal by DA Vance. The judge agreed with the plaintiff in that regard and ruled that the statute is unconstitutional as applied to a knife that cannot be flicked opened on the first or second attempt. The case and the judge’s decision relied heavily on elements developed in our own long-running Federal civil rights case against the City and DA. Judge Crotty did an admirable job weaving his way through and around the Second Circuit’s binding abysmal ruling on our case in order to provide a just and fair decision for Mr. Cracco. Both the judge and Cracco’s attorney, James Maloney, are to be congratulated in this regard. And, we are pleased that they were able to make use of our extensive record and arguments from nearly eight years of litigating this issue. But, it changes little of substance. The crux of the issue is that this decision may allow a person to assert a defense against prosecution, if, and only if, the arresting officer takes more than two attempts to succeed in “wrist flicking” a person’s knife open. And, absent some direction to the contrary from the District Attorney, it may not prevent an arrest in the first place, even though it probably should under those circumstances based on the Court’s decision. In any case, for most knife carriers in New York City it probably doesn’t matter, they still remain in legal jeopardy carrying a common folding knife. Most critically, this decision doesn’t address the underlying problem with the City’s and DA’s abusive and unconstitutional enforcement scheme, namely, that there is still no way anyone can be certain that their knife is not a gravity knife. Even if they cannot open it with a wrist flick, or nobody they know can open it with a wrist flick, doesn’t mean that an officer cannot open it with a wrist flick in the requisite two tries and arrest them for possession of an illegal gravity knife. The DA will then be quite willing to prosecute the knife owner. Knife Rights and our friends in New York City defending those caught up in this ongoing abuse of knife owners’ civil rights will be monitoring this carefully to see if either the City or DA Vance make any policy change as a result of this decision.We caution knife owners in New York City to be wary. Moreover, we’d like to remind New Yorkers and those traveling to and through the City, that besides this whole Gravity Knife issue, the city has its own ordinances regarding knives, including that you must carry 100% concealed. Clipping a knife to your pocket is asking for trouble in New York City. Click for full details. Meanwhile, Knife Rights case that is attempting to rid the city entirely of its infamous “wrist flick test” is on petition to the U.S. Supreme Court Three strong amicus briefs have been filed and the Court has directed the City and DA Vance to respond to plaintiffs’ petition for Writ of Certiorari.